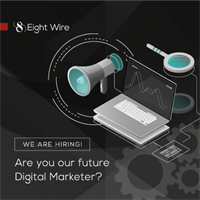 Eight Wire is a fast-paced digital marketing agency with a wide portfolio and a team of talented and professional individuals. We are looking for a Digital Marketer to form an important link between our technical team and clients. The successful candidate will have project planning ability and commercial awareness plus a strong interest in marketing and the online environment. Eight Wire is a conscientious employer and we are big on helping you to enjoy your job and your lifestyle. We have a beautiful work environment close to the centre of vibrant Falmouth and 30 seconds’ walk away from breathtaking views. Cornwall is a great place to live and work. We aim to be flexible and understanding in helping you find the perfect work-life balance. Think you have what we need and want to come and work with us? To apply, please send your CV and covering letter to info@eightwire.uk by midnight Monday 29th April 2019. Proposed interview date 3rd May with Sara Pugh.